Inevitably, international students experience a lot of differences as they embark on their academic journey in the United States. These differences may range from cultural norms, languages and dialects, to food, transportation, and daily routines. Many perceive these differences as gaps in knowledge or skills that need to be filled. International students often try to learn as quickly as possible from readings, peers, mentors, and advisors, but they may still feel like they are constantly playing the catch-up game and can never be just like their American peers. In the recent book titled “From Departing to Achieving: Keys to Success for International Students in U.S. Colleges and Universities”, we challenge this deficit-based perspective and encourage international students to see differences as strengths and opportunities. 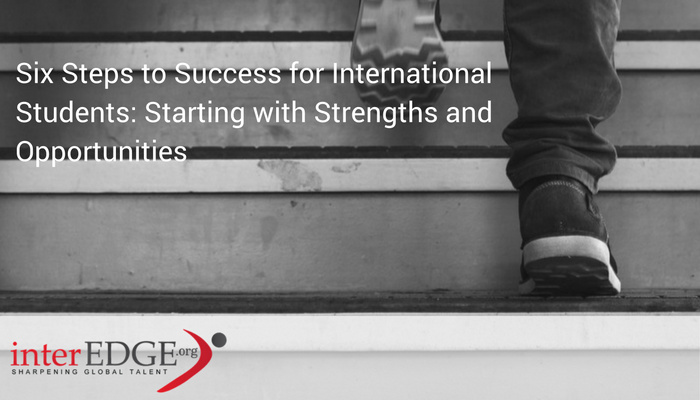 We propose 6 steps international students may want to consider as they take this perceptive in their transition process. First, examine your assumptions and expectations based on reflections about your personal educational experiences (Disarm). Making these assumptions and expectations clear would help debunk myths about learning in the U.S. and allow you to better articulate to your mentors, advisors, and instructors what your learning needs are. Second, surface and articulate your assets and strengths as a learner (Discover). You don’t have to start over! Since you already have many years of learning experiences, you bring a lot of great internal and external assets with you to your learning in the U.S.! Through the use of self-assessment instruments, you can discover your personal assets and be more aware of how to leverage them in the new learning environment. Third, verbalize and visualize your personal and professional goals (Dream). In addition to your immediate goal to successfully complete your coursework and graduate from the institution, what are your long-term goals and dreams? What would your personal and professional life be like 10 years and 20 years from now? These futuristic images are powerful as you align your present studies to purposefully prepare yourself for your own future. Fourth, strategically connect your assets and goals to plan for your actions (Design). Selecting majors, courses, co-curricular and extracurricular activities should not be random or just based on others’ recommendations. You are in charge of your own learning for your future! Building on the assets you discovered and the dreams you identified, you will be able to design a unique plan for yourself! Fifth, be reflective of your own cultural and academic transition process and embrace the differences (Deliver). Regardless of where you want to settle down after graduation, you are who you are because of your background and experiences. Your knowledge, skills, and experiences navigating both your home culture and the U.S. culture becomes a huge asset that distinguishes you from others. Embrace the differences and make that part of who you are! Finally, become a long-term learner and lead changes in your established networks and communities (Don’t Settle). The differences you note and the process you engage in to negotiate the differences will position you well to become a future leader in your community. Make time now to form networks and connect with different communities you are introduced to. The more you share with others, the more you can learn from interacting with other and what they have to share. This engagement will challenge you to reach your potential! Differences are not gaps to be filled. You do not have to overcome these differences before you launch your trajectory to success. Everyone has their own pathway toward the success they define. Start with viewing differences as strengths and opportunities and engage in these 6 steps toward your own pathway to success!